Senator Grace Poe has topped a non-commissioned senatorial survey initiated by several educators, data experts, and advocates. In the Kamuning Bakery breakfast forum in Quezon City, Carl Balita, owner of the Carl Balita Review Centers, said Poe would top the polls for senator if the elections were held Friday. However, Poe ranked just fourth in the awareness of the 4,536 respondents, said Balita, who owns 110 review centers across the country. Senator Cynthia Villar was No. 1 in the respondents’ awareness, but ranked just seventh as far as probable preference was concerned, he added. As the campaign period for the midterm elections hit its seventh week, several senatorial candidates barnstormed different towns and cities across the country. Otso Diretso candidates Chel Diokno and Romy Macalintal were also in Quezon City, as reelectionist Senator Bam Aquino toured Cagayan de Oro and former Interior Secretary Mar Roxas campaigned in Dagupan. Likewise, Otso Diretso bets Gary Alejano and Pilo Hilbay were in Manila, attending a forum with former Rep. Neri Colmenares. The administration’s Hugpong ng Pagbabago slate swooped down on Pagadian City with former police chief Ronald dela Rosa, journalist Jiggy Manicad, and presidential consultant Francis Tolentino. Other Hugpong bets barnstormed alone. Senator Sonny Angara visited in Tangub City; Senator JV Ejercito was in Palawan; and former senators Jinggoy Estrada and Bong Revilla were in Dipolog City and Pasay City, respectively. Senator Nancy Binay toured Maguindanao, while former Senate President Juan Ponce Enrile joined a local proclamation rally in Sorsogon and independent bet Leody de Guzman was in Oriental Mindoro. He said he used his review center’s branches nationwide to distribute questionnaires, gather data and validate survey results with the help of professionals in the academe. They included Dr. Sandra Montano, founder of Community Health Education Emergency Rescue Services; Dr. Rose Fuentes, Rosalina Fuentes, a research and organizational development expert; lawyer Arnel Mateo, a data privacy expert; Virlyn Francisco, a history professor; Marcon Valderama, an expert statistician and mathematician, and Pacifico Maghacot, Philippine Chamber of Commerce Inc.-Quezon City chapter chairman. “What is unique in our study is that we covered 17 regions’ 92 cities and 206 municipalities in Luzon, the Visayas and Mindanao,” Balita told reporters. The survey was conducted using face-to-face interviews. “We will do another survey 20 days before the [May 13] elections, but we are inclined not to make the results publicized,” Balita said. According to the survey, apart from Villar and Poe, the respondents knew well that former senator Ramon Revilla Jr., Senator Bam Aquino Jr., Ilocos Norte Gov. Imee Marcos, Senator Nancy Binay, former Philippine National Police Chief Bato dela Rosa, Taguig City Rep. Pia Cayetano, former presidential aide Christopher “Bong” Go, Senator Sonny Angara, actor and former senator Lito Lapid, Senator JV Ejercito and his half-brother Jose “Jinggoy” Estrada were all senatorial aspirants in the May 13 elections. Despite a low awareness ranking, Willie Ong ranked no. 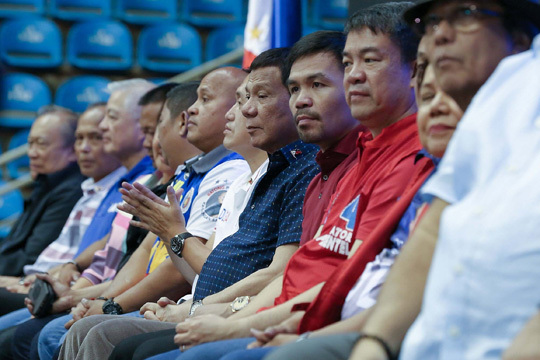 12 in the choice of the respondents, overtaking Ejercito, Aquilino Pimentel III, Serge Osmeña, Juan Ponce Enrile, Estrada, former Metropolitan Manila Development Authority chairman and ex-presidential legal adviser Francis Tolentino, and ex-senator Mar Roxas. The respondents chose Poe, followed by Dela Rosa at no. 2; Cayetano, no. 3; Angara, no. 4; Go, no. 5; Binay, no. 6; Villar, no. 7; Aquino, no. 8; Lapid, no. 9; Marcos, no. 10; Revilla, no. 11, and Ong, no. 12. Ejercito ranked no. 13; Pimentel, 14th; Osmena, 15th; Enirel, 16th; Ejercito, 17th; Tolentino, 18th; Roxas, 19th; former party-list representative Neri Colmenares, 20th; lawyer Larry Gadon, 21st, and broadcast journalist Jiggy Manicad, 22nd. “We do not want to compare our survey with the others because we have a different method,” Balita said.